Product Overview The TVS-682T features advanced hardware by adopting 6th Generation Intel 14nm multi-core processors and was designed around the concept of tiered storage, application-based partitioning and network traffic distribution. Providing a Thunderbolt DAS/NAS/iSCSI SAN triple solution, the TVS-682T delivers the incredible power of Thunderbolt 2 to double the speed potential to 20 Gbps, supports smooth 4K 60 fps video transfer and display, and is a perfect match for Thunderbolt-equipped Mac users for 4K workflows, file storage and high-speed sharing. Incorporating reliability, security and rich applications, the TVS-682T delivers the highest transfer rates ever as storage with persistent throughput, and provides a complete business-ready storage solution. The TVS-682T is powered by a high-performance Intel Core i3 dual-core processor and 8GB DDR4 RAM, driving outstanding system performance for CPU-demanding applications. Offering a comprehensive DAS/NAS/iSCSI SAN multi-mode storage solution in a compact form factor, the TVS-682T not only features Thunderbolt 2 technology but also has dual 10GbE ports giving you incredible flexibility for network connectivity. Note: Thunderbolt cables are not included as standard. Users must purchase Thunderbolt cables separately. The TVS-682T provides 2 SSD slots dedicated for caching to increase IOPS performance, and provides higher transfer speeds and reliability with the compact, energy-efficient M.2 SSD. Using an SSD cache boosts overall system performance, and is perfect for improving overall workflow of random IOPS demanding applications such as virtualization. The TVS-682T combines M.2 SSD, 2.5" SSD and HDD in one box to effectively realize tiered storage for exceptional application performance and lower TCO of storage at the same time. The TVS-682T features three HDMI ports, including one HDMI 2.0 port for smoothly playing Ultra HD 4K (4096 x 2304) videos. 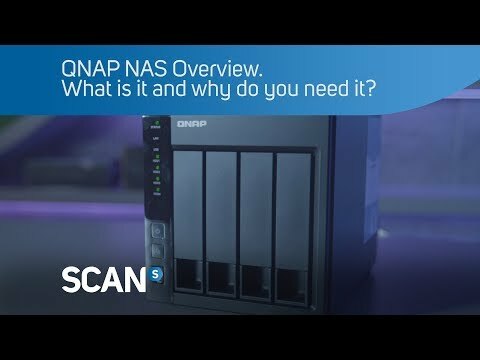 You can connect the TVS-682T to a TV or A/V receiver and use the powerful Kodi media player in HD Station with the QNAP remote control to enjoy rich media content and 4K 60 fps videos with the best audiovisual experience. Featuring Intel HD Graphics, the TVS-682T delivers superior real-time 4K (H.264) and 1080p video transcoding to convert videos to universal formats that can be smoothly played on PCs, mobile devices and Smart TVs. The TVS-682T comes with three HDMI outputs for using three monitors in either "duplicated" or "extended" desktop configuration. Duplicating will display the same content on every display, and extended desktop mode allows users to display applications across the displays for improved multitasking convenience and productivity. When displaying content using HDMI, you can use the TVS-682T as an amazing multimedia player by using HD Station to enjoy rich apps including Kodi, HD Player, Plex Home Theater, YouTube, Spotify, JRiver, Google Chrome, Mozilla Firefox, and more. Alternatively, you can choose to output the Linux operating system desktop to use the TVS-682T as a PC. The Thunderbolt 2 protocol uses industry-standard networking technologies meaning the high-speed transmission over your Thunderbolt 2 cable is able to run all network services (such as file sharing, FTP, and other services). The TVS-682T can also simultaneously run general Ethernet services in addition to the Thunderbolt 2 network, completely independently and with no bandwidth interference. You can flexibly allocate proper bandwidth for different concurrent tasks.